The ACTH test measures the ACTH blood level. Why is an ACTH blood test important? The ACTH test is helpful for evaluating adrenal function. This ACTH Test is a blood test. The ACTH test, sometimes known as an ACTH lab test, ACTH blood test and an adrenocorticotropic hormone test, measures the ACTH blood level. ACTH is a hormone secreted by the pituitary gland that plays an important role in the hypothalmic-pituitary-adrenal (HPA) axis. Sometimes known as adrenocorticotropin or corticotropin, ACTH is involved with the stress response and increases the production of glucocorticoid steroids such as cortisol by the adrenals which is why ACTH testing is sometimes performed along with the cortisol test. ACTH blood testing is often helpful in the evaluation of Addison's disease, Cushing's syndrome, adrenal carcinoma, ectopic ACTH syndrome, and adrenal nodular hyperplasia. High ACTH levels occur in Cushing's syndrome. Elevated ACTH levels are also seen in Addison's disease (primary adrenal insufficiency) in which the adrenal gland does not produce enough cortisol to shut down ACTH production. On the other hand, low ACTH levels, or adrenal insufficiency, is typically categorized into secondary and tertiary adrenal insufficiency. Secondary adrenal insufficiency is caused by a problem with the pituitary gland itself while tertiary adrenal insufficiency is caused by impaired stimulation of the pituitary gland by the hypothalamus. Getting an ACTH blood test near you at a Quest Diagnostics lab is relatively straightforward. Simply order online and get your blood drawn at the selected lab. Once the ACTH lab results are ready, they will be available for download. 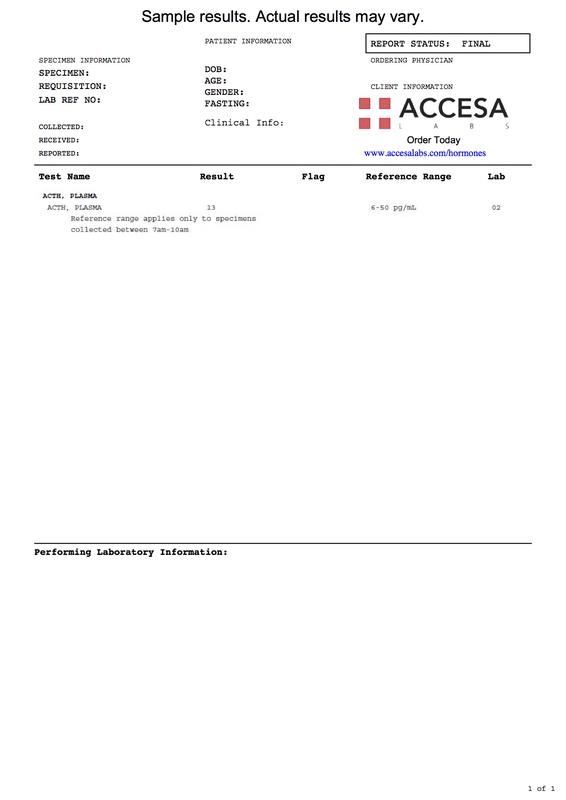 As can be seen on the sample ACTH lab report above, the ACTH blood levels are reported as a numerical value and can be compared against the reference range provided by the lab. It is recommended that people taking more than 5mg per day of biotin should wait at least eight hours before getting their blood drawn. ACTH levels may be inaccurate in people undergoing treatement with monoclonal mouse antibodies or who have high levels of streptavidin or ruthenium antibodies. ACTH Test at Guaranteed Prices.